In this essay we propose a view of the cerebral cortex from an unusual angle. 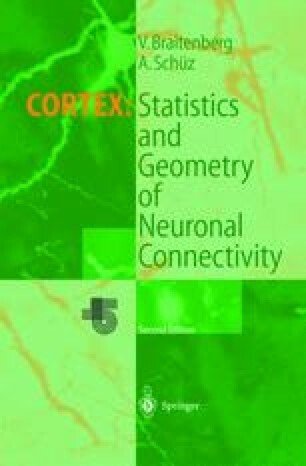 Our aim was an explanation of cortical structure in terms of functional principles, and, vice versa, a definition of the role of the cortex in the brain derived from its peculiar structure. Our results may be at variance with the ideas of those physiologists who have specialized subsystems of the cortex in mind, but are not in contrast with them, as we hope to show. Our view is akin to one presented by Moshe Abeles in his monographs Local Cortical Circuits (1982) and Corticonics (1991). It is related to the theory developed by Günther Palm, for many years our partner, in Neural Assemblies (1982). It owes much to the ideas which inspire the work of George Gerstein (beginning with the classic: Gerstein, 1962) and especially to the insights gained by our colleague Ad Aertsen and his group in Tübingen (now Freiburg). Our ideas on the cortex find some resonance in a particular brand of Artificial Intelligence (Kohonen, 1977; Hopfield, 1982; Rumelhart et al, 1986), and indeed a diagram representing the dominant idea of that trend, the associative matrix with feedback, was originally proposed as a summary statement of cortical connectivity (Braitenberg, 1974a).